If you purchase a lousy quality luggage set, you’re stuck with not one, but two to four bad pieces. It can quickly turn into a nightmare if you’re not careful about your decision. Well, you’ve come to the right place, because I’ll help you with choosing the best hardside luggage sets for your budget. First of all, when people refer to hard case luggage, hardside luggage, hard shell luggage or just hard luggage, they usually mean the same thing. They’re referring to a suitcase with a hard frame, often made from polycarbonate, ABS or aluminum. For this article, I’ve researched over a hundred different hardside luggage sets. I took a close look at the best-selling models and broke down their quality, reviews, features, and prices. All this, so you can be sure that you’re purchasing a good quality set, that will last for years. 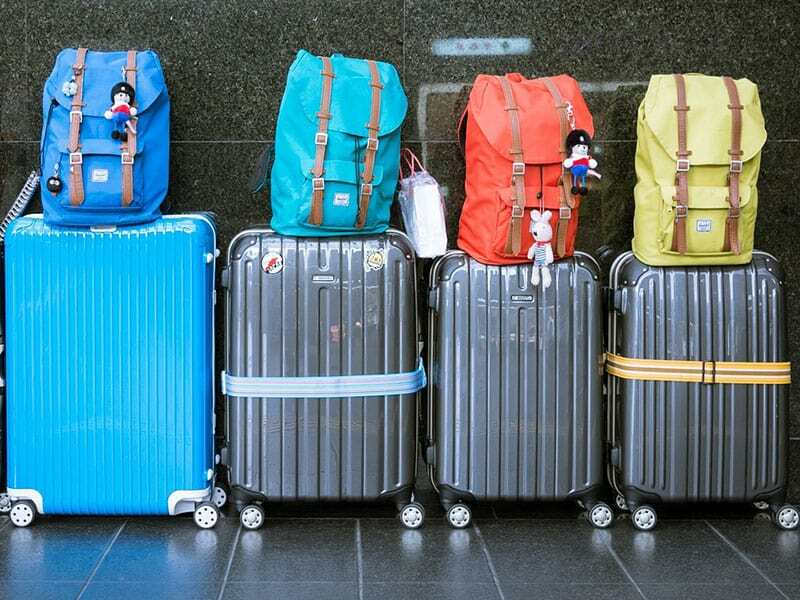 All of the eight luggage sets included in this list are superb choices. However, if you’re looking for hardside luggage sold separately, Ricardo Beverly Hills offers some exciting options. Ready to get started? Continue down below! The Winfield 2 is well reviewed, popular, stylish and versatile. Above all, it’s moderately priced. It’s the best overall option. The Merax PET luggage set is the best affordable option. It offers a 5-years warranty, scratch-resistant coating, and 360-degree spinner wheels. The Omni PC is basically an upgraded Winfield 2. For just a few dollars more, you get upgraded durability and quality. It’s indestructible. Why bother and buy a full luggage set? 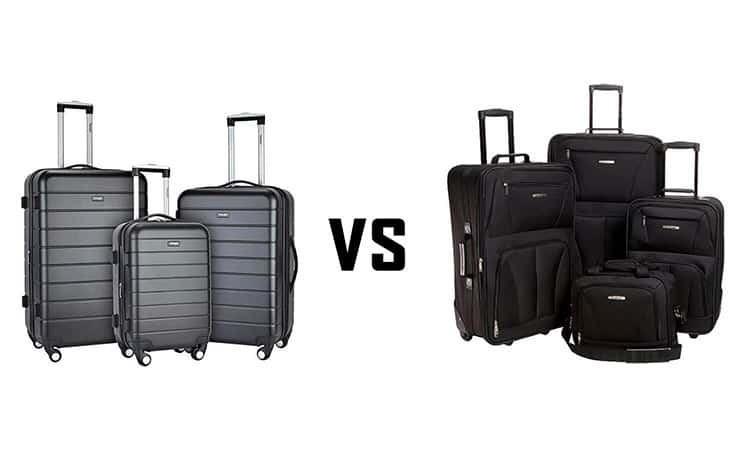 The neverending battle: Hardside luggage vs. softside luggage. Samsonite is a very well known luggage brand focused on making professional and durable luggage. With this set, you will get a ten year Samsonite warranty that you can trust, as Samsonite is very reputable for their outstanding warranty. The Winfield 2 luggage set by Samsonite is currently one of their best-sellers. Based on my research, this is the best overall option for hardside luggage sets. Samsonite Winfield 2 comes with four multi-directional spinner wheels for smooth movement. This means that the wheels can spin 360 degrees and easily snap to the direction that you’re pulling the luggage to, taking the weight off your hips. The injected polycarbonate material it’s made from is lightweight, has a brushed pattern for less apparent scratches and is profoundly impact resistant. This set comes in three pieces: 20 inches, 24 inches and 28 inches which are designed to fit the most airline standards. Speaking of standards, this case is equipped with side-mounted TSA locks, with your belongings safely secured. Also, the case comes with a few options for smart packing, like full-zip interior divider and cross straps for packing organization. If you choose this luggage set, it will be a smart investment that will last a decade, backed up by the ten years warranty. Merax is a luggage brand established in 1995. It’s pretty new, and that’s why this luggage set is so affordable. However, don’t be afraid by the short history behind Merax, as thousands of positive reviews back it up. Similar to Samsonite Winfield 2 luggage set, the Merax 3-piece luggage set also offers multi-directional 360-degree spinner wheels as well as a secure three digit lock. This hard luggage set is made from an innovative PET material which offers stiff resistance to stress and is pretty flexible. They claim that this luggage can withstand a 2-ton truck driving over it. This luggage set comes with a 5-year warranty, which is pretty decent for the price that you pay. All of the three pieces fit together in each other, which is especially handy if you live in a tight space. The Merax 3 piece hard shell luggage set is offered in these dimensions: 20 inches, 24 inches and 28 inches with the sizes designed to fit most airline restrictions. For the budget pick, I researched many different options and concluded that this is the best affordable hardside luggage set. Mainly because the price is really affordable and the reviews are way ahead of their competition. The Omni PC 3-piece luggage set by Samsonite is slightly more expensive than the Winfield 2. However, this one is made to withstand the harshest conditions, with an improved lightweight polycarbonate material that’s flexible and able to withstand significant stress. This luggage set comes with a TSA approved lock and 360-degree spinner wheels, covered by the ten year Samsonite warranty. Note that the specs are backed up by its outstanding reviews, with it reaching one of the highest customer ratings. The Samsonite Omni PC luggage set comes in three different sizes: 20 inches, 24 inches, and 28 inches, with the option of being expandable in width, to get more packing space. Samsonite Omni PC hard sided luggage set is made for frequent travelers that are rough on their luggage. It’s in the medium price range, and you get very high durability in return. Amazon has gotten so big, that they’re now selling their own items under that brand Amazonbasics. As the name states, they’re mostly basic items with high quality and a low price tag. The 3-piece hardside luggage set by Amazon is an excellent option that we will be taking a closer look at. First of all, it looks way more expensive than its price and comes in a scratch-resistant dotted finish that looks really well made. Also, this set comes with 360-degree spinner wheels for smooth movement. Oh, and it ’s available in several different color options (With black being my favorite one). The Amazonbasics hardside luggage set comes in three different sizes: 20 inches, 24 inches and 28 inches with the option of being able to expand in width to get +15% more packaging space. I’d recommend this set as a great affordable option because of the great looks combined with some of the best customer ratings out there. Can you say the name Hauptstadtkoffer out loud? I sure can’t! That’s because it’s a German luggage brand. Furthermore, they’re known for their dependability and quality. The Hauptstadtkoffer three-piece luggage set is available in 20 different colors. Yes, you heard it right, twenty glossy and bright colors. The design is simple and joyful, it doesn’t look like an expensive case, but it seems very well made. It’s meant for the average urban traveler. A weekend in Paris or two weeks in NY is what this luggage set is intended for. The Hauptstadtkoffer luggage set comes with TSA approved locks, 360-degree spinner wheels, made from flexible and robust PC + ABS materials and the three suitcases can be easily stored inside each other. Also, it’s offered in three different sizes: 20 inches, 24 inches, and 28 inches, with the option of being able to expand its width to get +15% more packing space. This luggage set is an excellent choice if you have a specific colorful style in mind, with so many different color options to choose from. It has excellent consumer reviews as well. The Traveler’s Choice is a luggage manufacturer established in 1984 which mostly makes premium quality suitcases. This 3-piece hard shell luggage set by Traveler’s Choice is similarly priced to the Samsonite Winfield 2, but it comes with more options, such as expandable width, additional elements for smarter packing and dual spinner wheels. What I like the most about this hard case luggage set is the edgy and modern design. The shell comes in a diamond pattern available in four metallic colors. It’s made from a pure 100% polycarbonate material that provides excellent impact and strength durability. The Traveler’s Choice Tasmania luggage set is equipped with TSA approved 3-dial combination lock and 360-degree spinner wheels. The dual wheels provide even smoother and snappy movability than regular spinner wheels. The Traveler’s Choice Tasmania 3 piece hardside set comes in these dimensions: 21 inches, 25 inches, and 29 inches, with the width being able to expand two more inches. The Traveler’s Choice luggage set is a great option if you are willing to spend a bit more. In return, you will get a set from a proven brand with reliable quality. I’m including this luggage set as an honorable mention because at the time of writing this luggage set is #1 bestseller in luggage sets on Amazon. Not only that, the reviews are excellent as well, backed up by a 2-year warranty. The Coolife 3-piece hardside luggage set is made from 100% ABS material which is very light and able to withstand strong forces. Another bonus is that it comes with a TSA approved lock, which is not common for luggage of this price. Also, double spinner wheels are included for easy movability. I like the brushed finishing, which makes the luggage scratch resistant, so after your 100th trip, your luggage still looks decent. It’s available in four different metallic colors, with silver being my top pick. This luggage set is available in three sizes: 20 inches, 24 inches and 28 inches with the option of being able to expand in width by 15%. The Coolife 3 piece hard sided luggage set is generally meant for the average traveler, giving you a sleek and modern design that comes with reliable quality. Delse Paris a well-known brand from France (As you would have guessed), often known for their elegant French design. This luggage set is no exception with the design being #1 reason why this set is included in the honorable mentions. Delsey is better known for selling luggage separately, so this luggage set doesn’t have many reviews. The Delsey Paris Alexis 3-piece luggage set comes with 360-degree double spinner wheels for easy movability. Also, the case is made from a durable ABS material that’s made for extended use, covered with a unique grained finish that’s scratch-resistant. This luggage set comes in 20 inches, 24 inches and 28 inches with an expandable width feature. The sizes are specifically designed to fit most airline standards. Delsey Paris luggage is meant for fashionable people due to their elegant but not too flashy design. Also, their luggage is really durable and receives lots of good reviews (With their customer support being one of the best out there). There are many reasons why you should invest in a set rather than buying your luggage separately. Generally, when you’re buying a set, you’re paying less for the same suitcases. Especially when buying a three or four piece luggage set. You can save enough to cover the last piece. 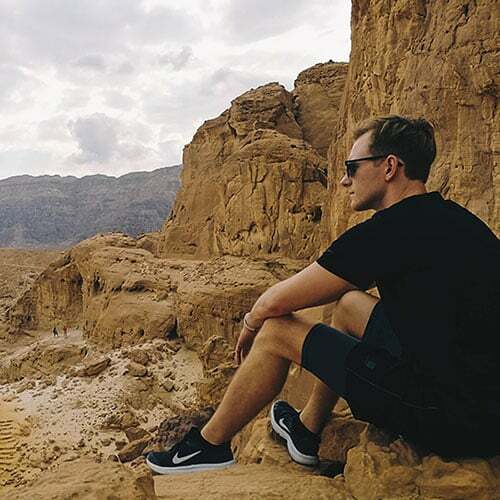 While we’re on the subject of saving money, here’s a great article on how to afford traveling. If you invest in a set, usually the suitcases can be neatly stacked inside each other for efficient storage. Other than that, it’s pretty cool that all of your suitcases look the same, which makes you look organized and well prepared. I won’t lie, I’m an over-packer. I’ve had a situation where my fabric carry-on was over-packed with stuff that I was taking home from my trip. In the end, I had to check it in and pay the extra fee. With hardshell luggage, you’re limited to the size of the frame, so overpacking isn’t an issue anymore. Although hardside luggage is heavier, spinner wheels make it super easy to move around, so weight isn’t an issue for me. I’d say that it’s a matter of taste, there are some good arguments why some people prefer softside cases. While researching content for cleverjourney.com, I’ve read thousands of luggage reviews (If not tens of thousands). So now I’m pretty well aware of the most common suitcase problems. Some are only common on hard case suitcases due to their build specifics. Also, there are many brand-specific issues which you can read about in this Luggage brand comparison I’ve compiled. Dents are the most common problem with hard-shell suitcases. Before buying a hardside suitcase, look through the reviews to see how resistant to dents it is. Spend a few minutes, and you will thank yourself later. Pro tip: If you manage to get a dent in your polycarbonate or ABS suitcase, you can try to fix it with a hairdryer, gently heating the damaged area up and pushing it back into shape. Generally, you’re looking for hard-sided luggage that has a finish with a rugged or brushed design that easily hides scratches. Just imagine how much your luggage is being thrown around during airplane loading and unloading. Scratches are inevitable. Look through reviews and make sure that deep scratches and paint peels are not typical. Actually, I’ve done it for you because all of the sets included in this compilation are scratch-resistant. You don’t want luggage made from a cheap plastic material that can crack easily. Generally, aluminum luggage doesn’t crack. However, all plastic and other poly materials tend to break under high pressure or when dropped from a few feet. Take a minute and skim the reviews section to make sure that cracks in the luggage case are not a common problem. Make sure to read the specs carefully, as sometimes (Even with the most popular sets) handles and spinner wheels are not included in the dimensions. This can make your luggage unuseable if it’s just a few inches above the airline limit. Not to worry because it can be quickly noticed when looking at the reviews. If this is the case, you will see a lot of bad reviews with people complaining that it’s larger than in the specifications. If you experience any more issues, here’s a great article on how to fix the most common luggage problems.